Add 1,5,or 10 items to the basket and SAVE on Unit Price.... The more you buy the more you SAVE!!!! Schwalbe butyl inner tube 26" to fit 1.5 - 2.5" tyres. Presta or schrader valve. Schwalbe makes great tubes for ebikes. I bought some extras for my Stromer. Awesome tubes high quality at a great price. Highly recommended. It's not a lightweight tube, but it's solid and holds air! Very good product from Schwalbe. Don't mind paying extra for a quality product. Nice transparent cap too! Good so far. Useful having the threaded nut on the valve to hold it in place. Not all competitions tubes have this. Quality product always buy Schwalbe inner tubes. Quick delivery too. Great inner tube. I like the lock ring that holds the valve in position at the rime when you're trying to inflate it. Its an inner tube, it keeps the air in, seems to hold up to my heavy handed riding "style". Have been buying these inner tubes for years. Very high quality, I especially like the valve housing, 100% metal, not like the cheap rubber ones you see on other tubes. They're inner tubes - what else? I bought these because I was changing my tyres to 2.3 and my old inner tubes only went up to 2.125 width. These have got a massive size range so ideal if you run different size tyres. Fitted three weeks ago and have done a number of miles on serious terrain and still not had to stop due to a puncture - great price. Excellent tubes, fairly lightweight and well-made. Superb Merlin price make these a great purchase. Quality inner tubes to go with puncture resistant Schwalbe tyres. Schwalbe quality. Held air well, no punctures so far, - two months of rocky singletrack riding. Basic tube, not the lightest but it's a tube. Good, dependable tubes, and good value too. However remember, the valves are removable from the tubes with these. So if using gas cartridges, don't over tighten the hose nozel onto the valve before filling, or when the gas cools the nozel and causes it to contract onto the valve thread, you will risk unscrewing the valve and losing all the gas when you attempt to unscrew the nozel! Good quality spare tyres. No worries. I have tried others, but these are a bit more robust. Always a quality product. Use them and Schwalbe tyres all the time. Great quality as you would expect from Schwalbe. Holds air better than most. Do the job they were designed for very well. Great price and superb service, Merlin Cycles are the best mail order company to deal with. Good, cheap tube with a wide size range to suit my skinny hardtail wheels and bigger Minions on the full susser. Not the lightest but seem ok for everyday abuse on rocky paths. Great price from Merlin, cheaper than anywhere else i looked. Best price I could find online. Fitted, inflated, no surprises. Top notch. Great tube for the price seem to be durable and so far no more pinch flats!!! Solid and durable tube. Great value for money. Does the job, not heavy - dispatched less than 90 minutes after I ordered. Superb. Inner tube in a box, clear dust caps, nice. Great tubes for me because they've got a removable valve core so you can put sealant in easily. Seem to be as good quality as any others, def better than cheapos. These tubes hold air well, aren't too heavy and don't cost the earth. Strong and Light, what more do you need from a tube !! Great price too. No complaints - does what you would expect. Clear valve caps which makes for a change. not needed the tube as yet so cant really comment. prob a bit heavier than other makes of tyres but thats because the tubes are slightly thicker than others. its the same type of tube currently fitted on my bike and have done several rides out on some severe black and red runs for long periods and no puntures as yet which is why i bought these as they can take a beating. quick,reliable delivery service with no fuss.Easy web site to shop with. Did the job.. had a lot of punctures but that was mainly due to the tyres I was using. A tube is a tube is a tube! I've used these tubes before which is why I ordered them again. 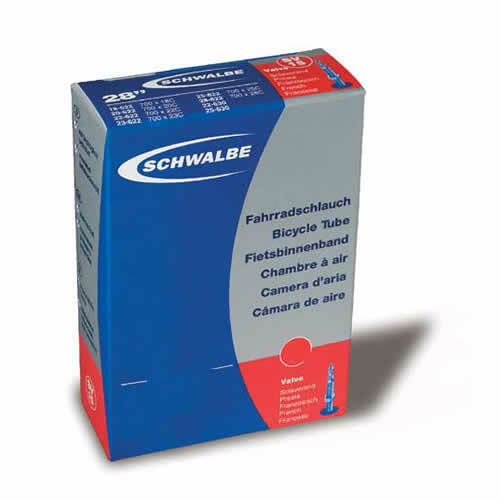 As you would expect from Schwalbe, they are good quality, not that heavy and good value. The presto valve is chromed and comes with a nice neat clear valve cap. I've never had a puncture with these tubes which says a lot for their durability. The only reason I purchased them was to replace the spare ones that I gave to my friends when they got a puncture and needed a new tube. The other advantage of this tube is that it covers an excellent range of tyre widths, 1.5" to 2.5". Buy them and it will be money well spent. Excellent inner tube at an excellent price. After buying some cheap tubes and having problems with them I decided to buy some Schwalbe ones and have been very happy with them. Good tubes. Not had any puntures in over 3 months use. A dependable inner tube, a bit heavy to carry in a day pack! Still looking for the ideal tube, but until then, this will do fine. A tad heavy but this makes them that slightly more durable. There are better on the market but for the money, excellent value. They do the job perfectly.